- dry process (dry sprayed concrete). Generally the main difference between the two methods is the point of water application to dry ingredients of concrete mix (or mortar). Wet process, also known as the wet-mix process, is a technology where traditionally prepared concrete mix (mortar), also with possible additives, is transported hydraulically to the application nozzle and from there pneumatically and continuously sprayed onto the receiving surface. Dry process, also known as the dry-mix process, is a technique where the dry mixture of cement and aggregate (or possible powdered additives) is served to a specially designed apparatus (a concrete spraying machine) from which, with a stream of compressed air, it is sent to the spraying (application) nozzle via a hose. To moisture the mix, water and potential liquid admixtures are led to the nozzle as a spray. Then the mix is sprayed onto the receiving structure. The choice of concrete spraying method is not simple, neither is deciding upon which of the methods prevails. Practice shows, however, that such choice cannot be accidental. It should focus on technological abilities and conditions of works performance. Nevertheless, each of the methods has its individual characteristics. higher w/c ratio = 0.40-0.55 (in weight). lower w/c ratio = 0.30-0.50 (in weight). 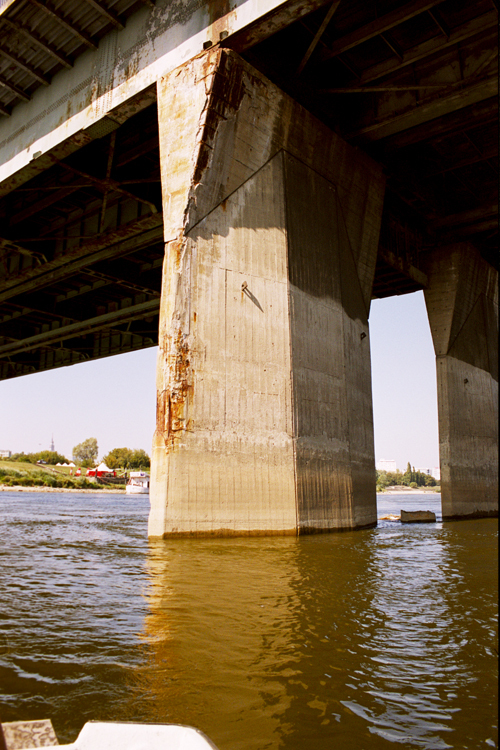 structural – in repair often connected with re-profiling. Sprayed concrete with aggregate grain size not smaller than 4 mm (max grain), with thickness more than 5 cm - grain size 8 mm and more. When designing an RC structure repair the same general design rules shall be obeyed as in the case of traditional concrete. No SPCC type materials are allowed. re-profiling – consists in filling of bigger concrete cavities with shotcrete. Depending on the damage, thickness of filling may even reach 50 cm. With cavities bigger than 5 cm mesh reinforcement with 10x10 cm centres should be incorporated. protection - it increases or reconstructs the thickness of concrete surround. The mix should be designed with max. 4 mm aggregate. SPCC mixes allowed. At the stage of preparing the base (chipping off, sandblasting, hydromonitoring) it is very probable that not all corrosion hotbeds in reinforcement steel will be discovered. In such case concrete mixes including migrating corrosion inhibitors MCI should be used. The MCI admixture makes the MCI particles penetrate the area not only in spots where corrosion hotbed was found but also, thanks to their ability to move in fresh and hard concrete, where steel is not uncovered. surface quality shaping – together with the protection function or when reconstructing the external surface quality of architectural elements mostly of historic buildings (e.g. old concrete or reinforced concrete handrails, arcs, vaults etc.). Sprayed concrete may also play a fire-resistant role.